For people who are so passionate about revealing the truth, getting justice and showcasing to the world how horrible Sri Lanka’s armed forces are would there be any need for “sequels”. The best thing would have been to pool everything available against Sri Lanka’s armed forces – mobile phone pictures, videos, eye witnesses and spill the beans – so what is the objective of these sequels every year close to Geneva sessions or some other international event? 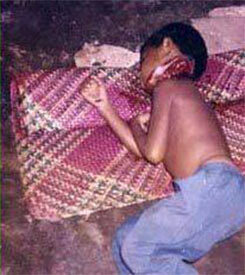 Channel 4’s presenter described the picture of Prabakaran’s son in 2012 as “barbaric” “chilling piece of footage” – what would he say of these pictures given above? 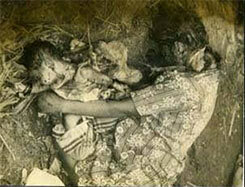 It would be most interesting to know Callum Macrae’s response to these pictures and given that he entered TV presenting and documentary work in 1992 onwards we would like to have answered why none of the LTTE heinous crimes against children as one can see by the photos above were newsworthy enough to be turned into a documentary and why a boy munching a cookie gets global coverage? 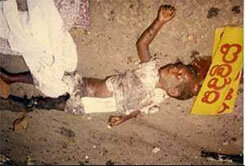 Moreover, what we are very keen to know which no one seems to have asked is where is Prof. Derrick Pounder the forensic pathologist at Dundee University who just needed to look at the picture of a bloodless child with gunshot injuries (Prabakaran’s son) and without a speck of doubt conclude that – he (Prabakaran’s son) was shot 5 times (erasing all doubt of other scenarios), that the “speckling from propellant tattoing” indicated the weapons muzzle was 2 or 3ft or less from the dead boys’ chest, suggesting the boy could have even touched the gun, that the boy had fallen backwards after being shot and the shooter had stood over him and fired the rest of the shots and his conclusion is “this is a murder” or “execution”. Prof Pounder also says “it was possible the boy was made to watch the execution of his bound and blindfolded guards before the gun was turned on him”. How can this Prof know Prabakaran’s son had 5 bodyguards – where or from whom did he get this figure? Do we need to conduct autopsies if we can come to conclusions like Prof. Pounder – which is why we are really missing his expert opinion in the 2013 sequel version of Callum Macrae’s No Fire Zone aimed at tarnishing Sri Lanka’s armed forces? Please bring these experts back in the 2014 sequel of Channel 4 and Callum Macrae close to Geneva. To Callum Macrae, Channel 4 and a host of others jumping on the bandwagon of annually producing sequels to tarnish Sri Lanka especially its armed forces the spectacle of “ahs” “ohs” and “wows” will diminish once people begin to realize these are all commercially motivated documentaries but if it makes the sponsors happy and funds keep coming so be it – let the lies pour out. 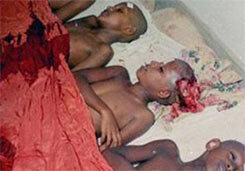 What we expect is some unbiased coverage – thousands of children were killed in barbaric ways by the LTTE. 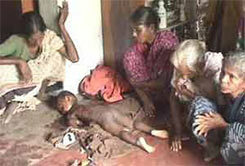 The GOSL has enough of video footage and photos covered at the scenes of these crimes through 3 decades – these pictures are what should “perturb” and be referred to as “horrendous crimes” far above a picture of a child lying with bullet wounds but no blood with a man in slippers close to the body questioning the inference of military being responsible – Sri Lanka’s armed forces do not wear slippers. The photos of the bunker at closer examination reveal sunlight but the picture of the body lying on the ground doesn’t correspond with the light and looks like someone had been fiddling with the picture. However, given these questions Callum Macrae, Channel 4 or any of their supporters cannot come to conclusions – allegations have to be proved first. Does Channel 4 seriously think that showing a sensational drama on a sequel basis can change the fact that approximately 295,000 Tamil civilians were saved, that 11770 LTTE combatants gave themselves up and majority of them have been rehabilitated and reintegrated with over 500 child combatants given State pardon while the army rescued wives and families of key LTTE leaders – without shooting them? Shooting everything that moved was the orders given to the US military – our military has shown we conduct military affairs far different. The people of Sri Lanka are all unanimous about one thing and that is our armed forces has done what no military in the Western world has been able to do after over a decade of “War on Terror” – the plan was to eliminate the LTTE ground force combined with an equal objective of saving all the civilians that the LTTE had been herding to use as human shields or civilian combatants – that venture cost 5000 military lives but saved approximately 295,000 Tamil civilians all of whom are now living and getting on with their lives in areas that now have electricity where no electricity prevailed because the LTTE blew up the grids. Callum Macrae, Channel 4 can produce any amount of documentaries but these cannot change the facts that we see before our eyes – a picture may be worth a thousand words but what we see with our eyes when we travel to areas that were out of bounds is worth tenfold that number. Next articleUN urged to visit SLN officers Detained at Welikada by Yahapalana Gov. ජිනීවා යෝජනාවලට ඒකාබද්ධයත් අනුග්‍රහය දක්‌වනවා ද?